A healthy lawn not only looks attractive and provides a focal point for your garden; it also offers a multitude of wonderful advantages for health and the environment. How can maintaining a well kept lawn benefit our health and the environment? Firstly, it will absorb airborne pollutants like dust and spores, taking them out of the air and preventing them from irritating the respiratory systems and skin of those that suffer from asthma, eczema and allergies. Secondly, like any plant, grass converts carbon dioxide to oxygen, thus cleansing the air that we breathe and working towards lowering the effects of global warming. Thirdly, a lawn filters pollutants from rainwater so that a cleaner form of water runs through into the soil, down through the water cycle and into our lakes and seas. Preventing soil erosion is the fourth benefit of a lawn; a layer of grass prevents soil from being washed away or broken down so that it can continue to provide a breeding ground for plants and insect life, and in turn a haven for birds and wildlife. 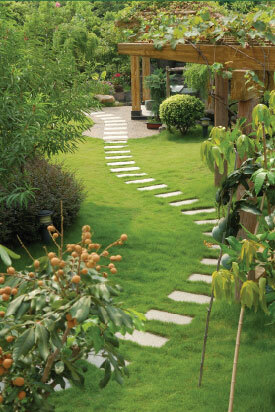 Keeping a healthy lawn in your garden can have a global impact. Making sure that your area of grass is well fed and maintained is vital, so ensure you do your bit for the environment and choose a trusted supplier for your turf, grass and topsoil and lawn maintenance products and advice. Select a company that has been around for many years and has a strong local reputation, and one that is dedicated to providing only the very best quality products and turf laying service.